We continue to get more evidence that the U.S. economy has entered a major downturn. Just last week, I wrote about how U.S. GDP growth numbers have been declining for three quarters in a row, and previously I wrote about how corporate defaults have surged to their highest level since the last financial crisis. Well, now we are getting some very depressing numbers from the rail industry. As you will see below, U.S. rail traffic was down more than 11 percent from a year ago in April. That is an absolutely catastrophic number, and the U.S. rail industry is feeling an enormous amount of pain right now. This also tells us that “the real economy” is really slowing down, because less stuff is being shipped by rail all over the nation. One of the economic commentators that I have really come to respect is Wolf Richter of WolfStreet.com. He has a really sharp eye for what is really going on in the economy and in the financial world, and I find myself quoting him more and more as time goes by. If you have not checked out his site yet, I very much encourage you to do so. Total US rail traffic in April plunged 11.8% from a year ago, the Association of American Railroads reported today. Carloads of bulk commodities such as coal, oil, grains, and chemicals plummeted 16.1% to 944,339 units. The coal industry is in a horrible condition and cannot compete with US natural gas at current prices. Coal-fired power plants are being retired. Demand for steam coal is plunging. Major US coal miners – even the largest one – are now bankrupt. So in April, carloads of coal plummeted 40% from the already beaten-down levels a year ago. These engines are expensive pieces of equipment. 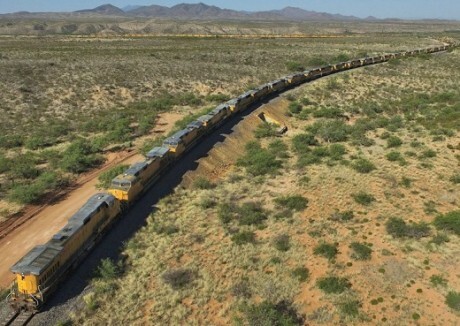 When they just sit there, not pulling trains, they become “overcapacity,” and they get very expensive. Then there are engineers and other personnel who suddenly become unproductive. Some of them have already been laid off or are getting laid off. All over the world, similar numbers are coming in. For example, the Baltic Dry Index fell 30 more points on Wednesday after falling 21 on Tuesday. Global trade is really, really slowing down during the early portion of 2016. What this means on a practical level is that a lot less stuff is being bought, sold and shipped around the planet. It is becoming increasingly difficult for authorities to deny that a new global recession has begun, and at this moment we are only in the very early chapters of this new crisis. Another thing that I watch very closely is the velocity of money. When an economy is healthy, people feel pretty good about things and money tends to circulate fairly rapidly. For example, I may buy something from you, then you may buy something from someone else, etc. During the last recession, the velocity of money declined precipitously, and that makes perfect sense. But then a funny thing happened. There was a slight bump up once the recession was over, but then it turned down again and it has kept going down ever since. In fact, the velocity of money has now dropped to an all-time low. 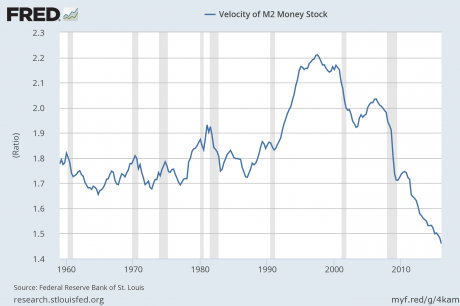 The velocity of M2 just recently dipped below 1.5 for the first time ever. This is not a sign of an “economic recovery”. What this tells us is that our economy is very, very sick. Homelessness rose 11% in the city of Los Angeles and 5.7% in the county last year despite an intensive federal push that slashed the county ranks of homeless veterans by nearly a third, according to a report released Wednesday. The increase marks the fourth consecutive year of rising homelessness in L.A., as local officials struggle to identify funding for billion-dollar plans they approved to solve the nation’s most intractable homeless problem. Let us also not forget that about half the country is basically flat broke at this point. Just recently, the Federal Reserve found that 47 percent of all Americans could not pay an unexpected $400 emergency room bill without selling something or borrowing the money from somewhere. With numbers such as these being reported, how in the world can anyone possibly claim that the U.S. economy is in good shape? It boggles the mind, and yet there are people out there that would actually have you believe that everything is just fine. The current occupant of the White House is one of them. With each passing month, the real economy is getting even worse. We may not have slipped into a full-blown economic depression just yet, but it is coming. For now, let us be thankful for whatever remains of our debt-fueled prosperity, because we don’t deserve the massively inflated standard of living that we have been enjoying. We have been consuming far more than we produce for decades, but it won’t last for much longer. And when those days are gone for good, we will mourn them bitterly.